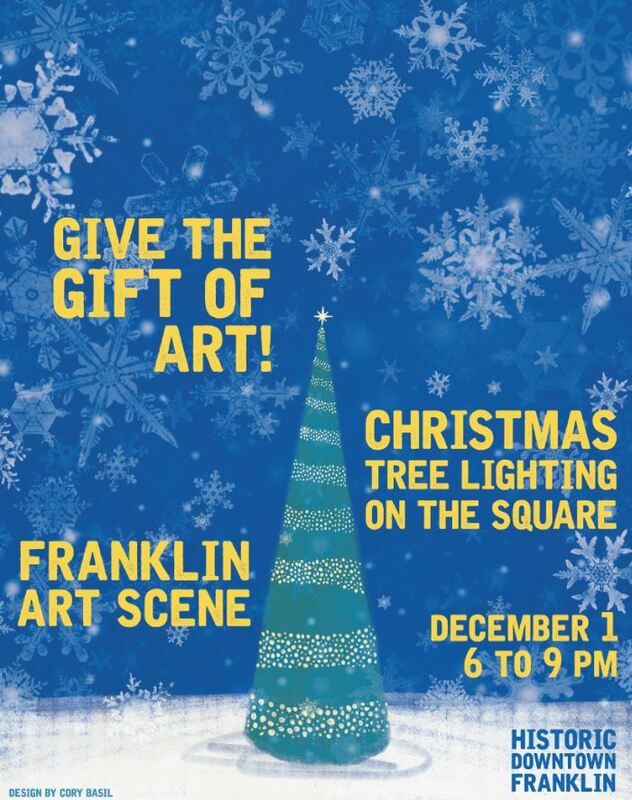 Franklin Art Scene Coincides with Franklin Tree Lighting! Academy Park Enrichment and Performing Arts, located at 120 Everbright Ave., will host the works of artists Yara Stagner, Sandy Thompson, Robert J. Lee and Aracely Landa. Franklin First United Methodist, located at 148 Fifth Ave. S., will feature the student artwork of Independence High School and a Nativity themed night, sharing one of the most beloved Christmas traditions. Gallery 202, located at202 Second Ave. S., will feature Kelly Harwood, renowned artist and owner of the world-class gallery in Franklin. Hope Church, located at 137 4th Ave. S., will host Stephanie Carpenter and her art of whimsical faux taxidermy decor for kids. Imaginebox Emporium, located at 311 N. Margin St., will showcase original illustrations created by Cory Basil. Moyer Financial, located at 400 Main St., will host artist Sharon Register and many of her paintings. Taziki’s, located at 428 Main St., will host Christopher Hanna and his collection of children’s art. Williamson County Archives, located at 611 W. Main St., will feature works by Amy Marie, a Self-taught Artist from Nashville working in acrylic and mixed media to express emotion through brush and poured techniques. Zula & Mac, located at 301 Lewisburg Ave., will feature artists Judith Bohorquez, Rayanna Silva and Linda Burns. The Downtown Franklin Association invites lovers of the arts to stop by all participating locations during the evening’s crawl, in addition to enjoying the festivities of the Christmas Tree Lighting on America’s Favorite Main Street. The Art Scene trolley is also available for free rides throughout the crawl, sponsored by Genesis of Cool Springs.